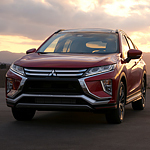 Has the Mitsubishi Eclipse Cross caught your eye? This compact SUV is a top choice among our consumers at Mark Mitsubishi. Many of our consumers are impressed with this model because it offers a number of innovative safety features that help keep you and your passengers protected. The available Rear Cross Traffic Alert system is equipped with the Eclipse Cross. This feature uses sensors to detect for vehicles that approach on either side of the SUV when you are backing up. When a vehicle is detected when you are in reverse, the side mirrors will blink. You will also be provided with a warning on the information screen. Blind Spot Warning and Lane Change Assist are also offered with the Eclipse Cross. The Blind Spot Warning system alerts you when a vehicle enters you blind spot zones. If you activate the turn signal when a vehicle is in your blind spot, the Lane Change Assist system will let you know it's not safe to change lanes with an audible alert.